After digging through thousands of crash reports, NBC Boston found that these are the five interchanges where you're most likely to be involved in an accident. The rush hour commute in Boston can be brutal - not to mention dangerous. NBC Boston dug through thousands of crash reports to find the top five intersections in Massachusetts where you’re most likely to get into a car accident. The worst one? Columbia Road at the Southeast Expressway in Boston's Dorchester neighborhood, with 296 reported crashes - 78 involving injuries -according to 10 years of state Department of Transportation data through 2013. “I come through here every day and traffic is always a mess, so it doesn’t surprise me that this is one of the most treacherous places to cross in the city," one driver at the intersection told NBC Boston. 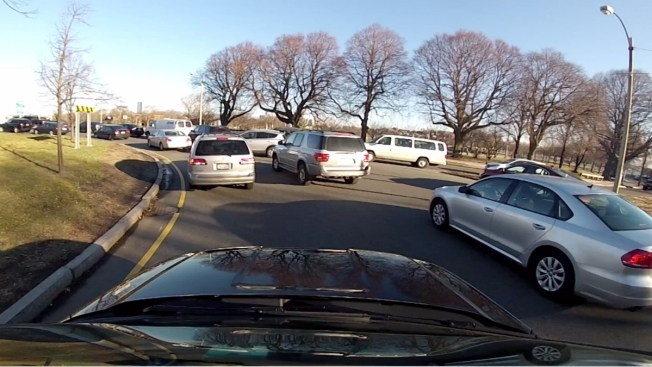 Peter Furth, Professor, Civil and Environmental Engineering at Northeastern University, dissects Boston's most dangerous intersections and shows why they are a headache for drivers. The majority of the worst intersections in the state are clustered along Route 128 and Interstate 93. Several areas in Springfield, Worcester and the Merrimack Valley also had pockets where more than 100 accidents were reported. These are not the most deadly sites in the state, but among the places with the most dings, fender benders and headaches. Places where frustrated commuters tell us people run red lights, text while they drive and fail to pay attention. The top intersections for fatal crashes are I-93 at Interstate 495 in Andover and routes 3 and 18 in Weymouth. The second worst intersection is the Middlesex Turnpike at Route 128 in Burlington, with 295 crashes. "No matter where you go around there, it's pretty busy," one motorist said. The third worst intersection is Granite Avenue and the Expressway in Milton, with 245 crashes. We observed traffic at that interchange, and found drivers consistently pulling illegal U-turns to jump onto the interstate. The fourth worst intersection is North Washington Street and the Central Artery in Boston, with 232 crashes. And the fifth worst intersection for crashes is the area of Route 128 and Interstate 93 in Woburn, with 225 accidents. Most of these intersections aren't deadly, but they bring big headaches on your way into work or your commute home. A fender bender can cost thousands of dollars, without even factoring in having to take time off work. Even newer interchanges from the Big Dig, just 10 years in the rearview mirror, are among the worst for accidents. One example is the ramp from the Massachusetts Turnpike to Atlantic Avenue. Milton's Lt. Foley said slowing down traffic and keeping people from pulling illegal U-turns is key to reducing crashes. “What we’ve been doing is putting out directed patrols to try to slow some of the traffic down and do away with some of the illegal turning in here," he said. "Slow the traffic down coming off the ramp”. MassDOT declined an on camera interview, but said in a statement that it is focused on reducing crashes.